Ever dreamed of actually stepping inside a work of art, Mary Poppins-style? 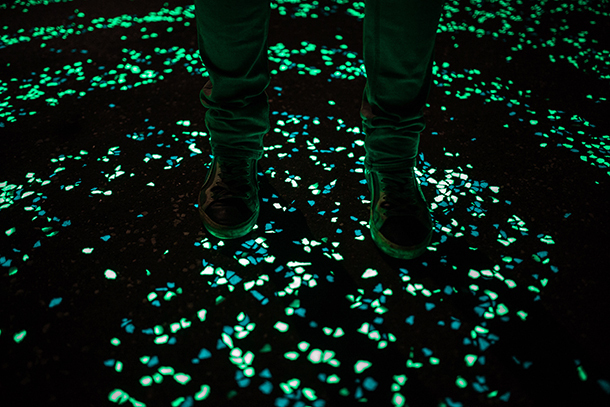 A Dutch design lab, headed up by artist and innovator Daan Roosegaarde, has just taken your fantasy one step (or one pedal) closer to reality. 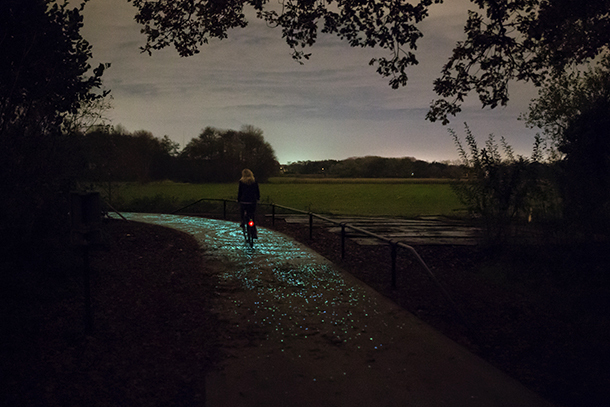 On November 12, Studio Roosegaarde opened a magical, glowing bike path inspired by Vincent van Gogh’s The Starry Night in the city of Eindhoven in the Netherlands. 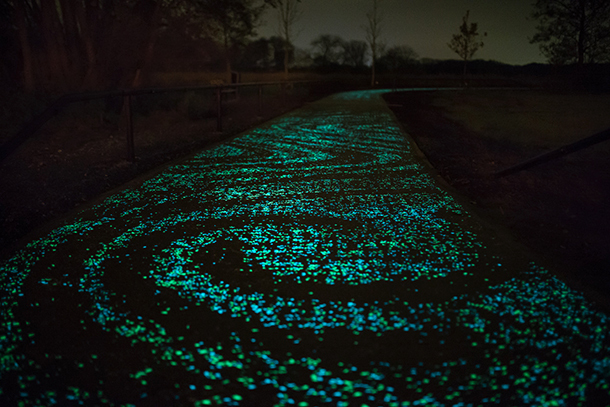 The .6-mile path is lit by 50,000 twinkling solar-powered stones, which charge up during the day and glow in the dark by night, as well as thousands of LED lights. When darkness sets in, the swirling swaths of illuminated stones and lights mimic the starry sky in Van Gogh’s famous painting. It’s a dazzling, fairy-tale-like visual. The opening of the path marks the beginning of the Van Gogh Europe Foundation’s international Van Gogh theme year, celebrating the Dutch artist’s inspiration. The 125th anniversary of Van Gogh’s death is July 29, 2015, and all year, his life and work will be commemorated with cultural programs and events at museums and heritage locations around the country as well as in Belgium and France. The path itself is part of the Van Gogh cycle route, which was created in partnership with the foundation and connects various locations in the Brabant province, where Van Gogh lived and worked. Visitors can cycle through the towns and cities that were important in the painter’s life—Tilburg, where he took his first drawing lessons; Etten, where he sketched his first models—while also taking in the beautiful Brabant countryside. For more information about the cultural programs celebrating Van Gogh though the end of this year and in 2015, visit the Van Gogh Europe Foundation’s website.